HR&A led a multidisciplinary team to develop comprehensive, strategic resilience plans for at-risk communities that were severely impacted by Superstorm Sandy, Hurricane Irene, and Tropical Storm Lee, and developed projects eligible for over $128M in federal disaster recovery funding. On behalf of the New York State Office of Storm Recovery’s New York Rising Community Reconstruction Program (NYRCR), HR&A led a team of engineers, architects, planners, landscape architects, healthcare and other specialists to run two rounds of the NYCRCR Program. In close coordination with the general public and planning committees, comprised of local civic and social leaders within each community, the HR&A-led team developed comprehensive community plans for investing over $128M of federal Community Development Block Grant Disaster Recovery funding towards strengthening the physical, economic, and social resiliency in Lower Manhattan, Red Hook, Howard Beach, Broad Channel, communities across the Rockaway Peninsula, Canarsie, Bergen Beach, Mill Basin, Marine Park, and several communities along the East Bronx Waterfront. Proposed policy recommendations to ease the burden on building owners and increase access to more programs and funds. 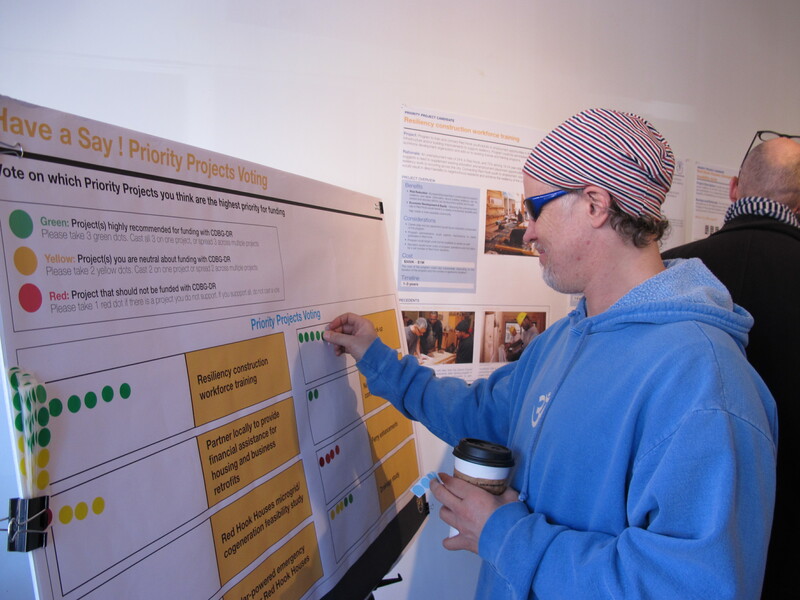 In addition, HR&A managed the extensive community-led participatory process, running over 100 committee meetings and 40 large-scale public engagements, to iteratively gather feedback and present proposals and the community plans. In total, the team generated more than 120 near-term resiliency projects, each tailored for the specific community. As of early 2016, Governor Cuomo has announced funding for four projects that the HR&A-led team drafted in collaboration with NY Rising communities: an energy resiliency feasibility study for New York City Housing Authority’s Red Hook Houses, a residential technical assistance pilot program in seven impacted communities, and two business corridor improvement projects, totaling over $12 million, for communities of the Rockaway Peninsula. The State is processing additional projects through the United States Department of Housing and Urban Development for implementation by City agencies and community organizations. In addition to this, FEMA has funded $1.2 million to advance technical and feasibility analyses of a double dune system in the Breezy Point community on the Rockaway Peninsula that was designed in concept in the NYRCR process and supported in the final plan. In his February 2016 State of the City speech, Mayor de Blasio announced a $91 million investment in downtown Far Rockaway, and has emphasized the importance of streetscape improvements in the Rockaway East community. The City has also approved the plans for implementing permanent ferry service to Rockaway West, a major priority advocated by the community’s planning committee. A joint commitment by New York City and State in the amount of $100 million for an integrated flood protection system will protect Red Hook from future storm surges and the Governor’s Office of Storm Recovery is more than doubling the City’s initial investment of $3 million in funding for the launch of the NYC Business Preparedness and Resiliency Program with an additional $4.51 million.